Effortlessly Go From One Meal To The Next with this Ybm Home Foldable Dish Drying Rack. Instead of leaving your dishes piled high – which causes trapped moisture and results in unattractive watermarks on your plates, cups, cutlery, etc. – let your dinnerware air-dry in high style with this dish rack from Ybm Home. This wonderful dishwashing accessory introduces a nice pop of decor to your kitchen and provides slots for full-size dinner plates in addition to a rack for drinking cups. Best of all, it cleans easily with water and soap. Keep your dishware handy in your counter top with this Ybm Home dish drying rack. 2 tires and plenty of slats for storing plenty of plates and cups(depending on cups size). Collapsible for Storage: This rack can be folded flat for easy storage, perfect for small kitchen. Many slats and X design help air dry your plates and cups faster, avoid mildew, so that you do not have to wash the rack often. Dry or store your dishes with ease with the Ybm Home Kitchen dish rack. The rack is both stylish and functional on your counter. 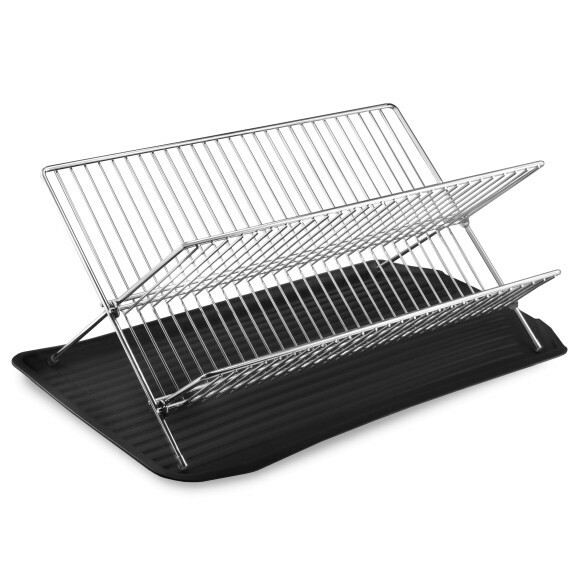 This steel dish rack with its matching mat is ideal for air drying or storing your dishes. Cups, glasses and mugs can be rested on the angled shelves, while slots allow for secure holding of many dishes. Don't just get another cheap dish rack. Get one that will last a lifetime and will provide value to your family.